As I read other foodie sites and watch trending recipes, Overnight Oats seem to be right up there with anything healthy and easy to prepare. I’m all for it. Once I tried them, they became a favorite way to start the day. Fiber, protein and some kind of fresh fruit and…wow. Tasty. But then, I really like my oatmeal. No matter how it’s prepared. One of my most requested recipes every time I share them is for Chocolate Chip Oatmeal Cookies. Here you go. Eating oatmeal just plain makes sense. One half cup of dry oats–that’s a single serving–contains 4 grams of fiber. That’s 16 percent of your total fiber needs for the day. The recommended daily intake of fiber is 25 grams for women and 38 grams for men. Oats also contain the minerals manganese, selenium, phosphorus, magnesium, and zinc. That little package of goodness also provides 5 grams of protein and less than 1 gram of sugar. 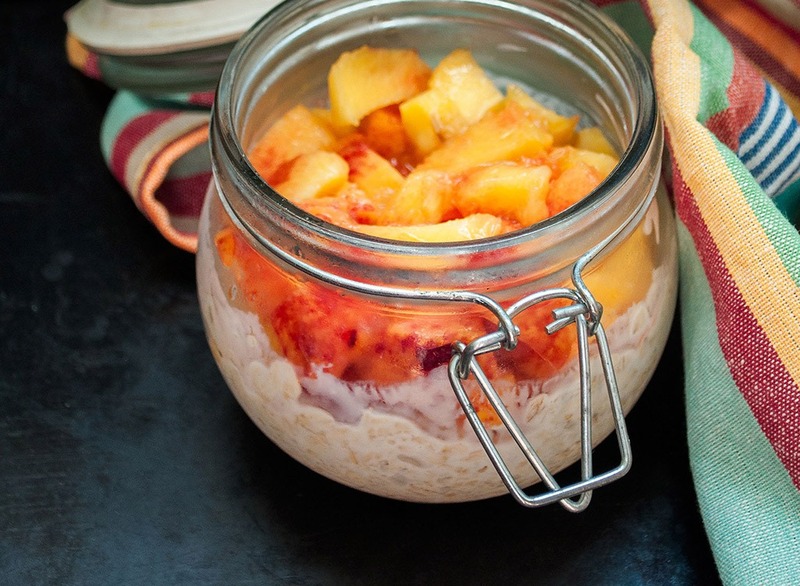 Those Overnight Oats are looking better all the time, now aren’t they? Sara Bonham, an athlete, scientist and product developer, has written a great article listing some of the benefits of eating oatmeal you may not be familiar with. She did the research (so I didn’t have to) so it’s not just her opinion. A couple of pieces of information on that list were news to me. Since I keep bringing up those Overnight Oats, how about I help you out with a basic recipe and some variations you can try? It’s also sort of trendy to prepare them in those pint mason jars, but you can use whatever works for you. An empty peanut butter or a jelly jar will work. Some people just mix them up in the bowl and put them in the fridge overnight. I like mine with plain Greek yogurt and a mix of berries, but I’ve seen some combinations that sound pretty tasty. (Almond Joy!) And the combinations are endless when you consider people use such ingredients as nuts or chia seeds, dried fruit, fresh fruit, nut butters, pumpkin, spices, and quinoa. All mixed in with humble oatmeal, a pantry staple that’s inexpensive and healthy. Hey, is your family like mine was when I was growing up and you sometimes like to have breakfast for dinner? Oatmeal is making its way into pancakes these days too. Try these, maybe. This foodie is hoping you begin to put oatmeal into your diet if you haven’t already done so. Oatmeal: it’s not just for breakfast anymore.